How do I Clean Kitchen Cabinets? Grime on dirty cabinets can be scrubbed with a baking soda and water mix. Lemon juice can be used to clean kitchen cabinets. Cleaning your kitchen cabinets can be a quick, easy task or it can take hours, depending on what kind of shape the cabinets are in. One common problem is that grease, food particles, and smoke can stick to the surface of the cabinets, making them grimy. Since the main culprit is usually grease, it's important to clean kitchen cabinets with products that cut grease but don't create additional buildup. You'll want to choose the best cleanser and consider whether you're going after exterior or interior cabinet grime. 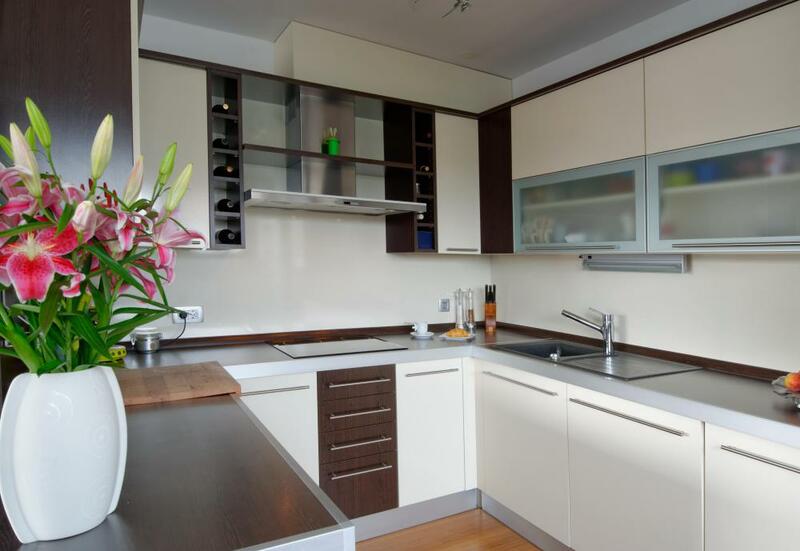 Generally, to clean kitchen cabinets, you'll want to start by wiping down the exterior with cleanser; after removing all dishes, food, or other items inside the cabinets, vacuum or sweep dirt from the shelves inside, and then wipe them down as well. 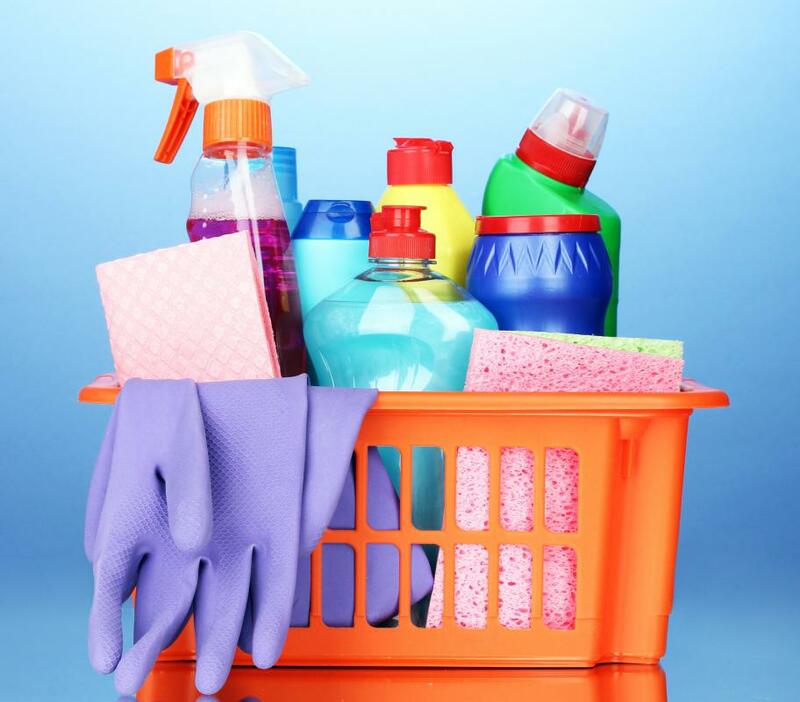 Dishwashing liquids or mild laundry detergents are effective cleaners for most cabinet materials. To make sure your cleanser isn't too strong, you may want to dilute one part detergent in two parts warm water to make an easy kitchen cleanser. 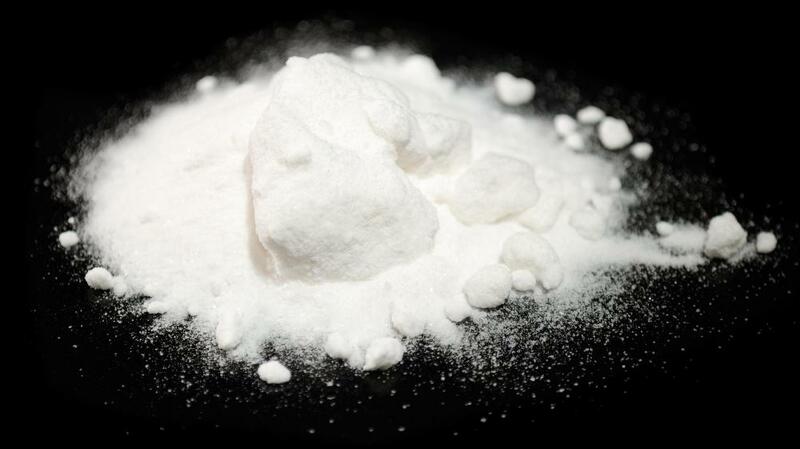 When using laundry detergent, it's a good idea to use one that is specially designed to remove grease and oil. You can also use an all-purpose household cleaner to clean kitchen cabinets, but read the label carefully to be sure it won't ruin the finish. It's also a good idea to test the cleaner on a hidden area of one of the cabinets; many commercial household cleaning products leave a sticky residue, and some can cause significant damage to wood finish or paint. Be sure to empty the cabinets before using a harsher detergent or chemical, even on the outside so that your dishes remain protected. Vinegar is a good, natural, all-purpose cleaner that can clean kitchen cabinets and remove buildup. Try using a solution of half vinegar and half water for cabinets that just need a regular cleaning; to cut through greasy buildup, apply undiluted vinegar. 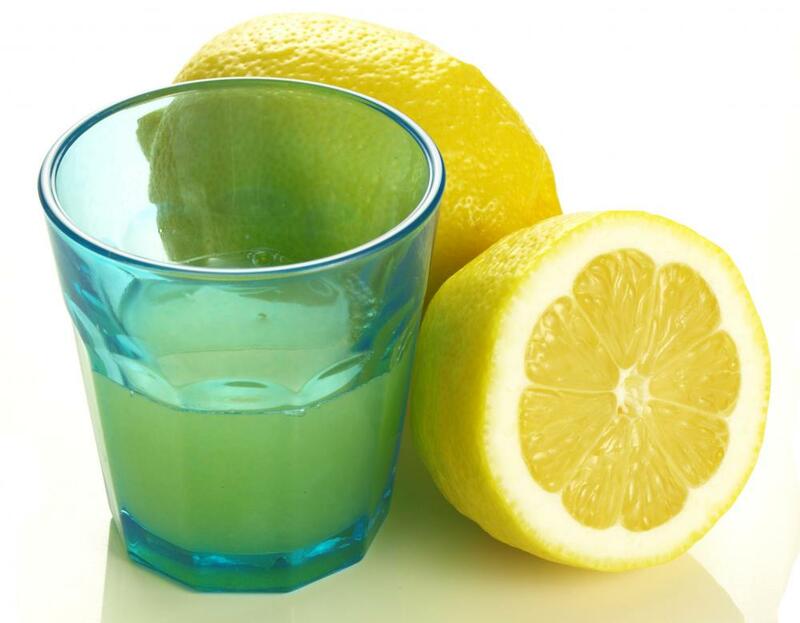 Lemon juice can be used instead of vinegar if you don't like the smell. A paste made of baking soda and water also makes a good natural scrub and helps remove a lot of grime from dirty cabinets. Clean kitchen cabinets from the outside in by gently scrubbing the exterior surfaces using a sponge or an old washcloth and whichever cleaning solution you choose. Don't use steel wool, scrub brushes, or any other item that can scratch the finish. It's a good idea to start in an inconspicuous area to make sure that your cleaning doesn't damage the cabinet. Once you've started cleaning, pay particular attention to the area around door handles and drawer pulls, as these places tend to be the stickiest. If possible, removing cabinet hardware before cleaning will make it easier to clean these areas. After removing the contents of the cabinet, vacuum, sweep, or wipe up any crumbs or food particles from inside the cabinets. Using a sponge or cloth, use one of the cleaning solutions to clean the shelves, bottom, and sides of the cabinet interior. In some cases, the shelf liners may need to be replaced if they are too dirty or worn. Before putting food or dishes back in the cabinet, make sure you wipe down the interior with a clean, damp cloth and dry it with a towel or washcloth to remove any cleanser residue. Since kitchens get so much use, cleaning your cabinets on a regular basis can help improve the look — and health — of the space. After a deep cleaning, be sure to give the cabinets a periodic wipe down with warm soapy water in order to keep them looking their best. Cabinets that look dull even after cleaning can be buffed with a furniture wax or polish suitable for their specific materials and finish. How Do I Choose the Best Kitchen Drawer Pulls? How can I Remove Grease from Metal? How can I get Grease out of Clothing? How can I Find Someone to Clean my House? What is the Best Way to Clean Linoleum? What is a Lazy Susan? and white faded areas on their tables. If you want something that works for the greasy buildup and to remove scratches and white rings and doesn't leave any greasy stuff all over the furniture this is the product for you too. I will never be without this product. I even wrote a review on the website. I have a house that has been closed for a year and the last couple of times I opened it, there was a brown sticky substance on the kitchen cabinet that is against the fridge and it was clean when I left it. What is this substance and why it is forming? Sugar Soap removes anything and everything but does not harm the wood. Great for shower tiles where the grout is dirty. 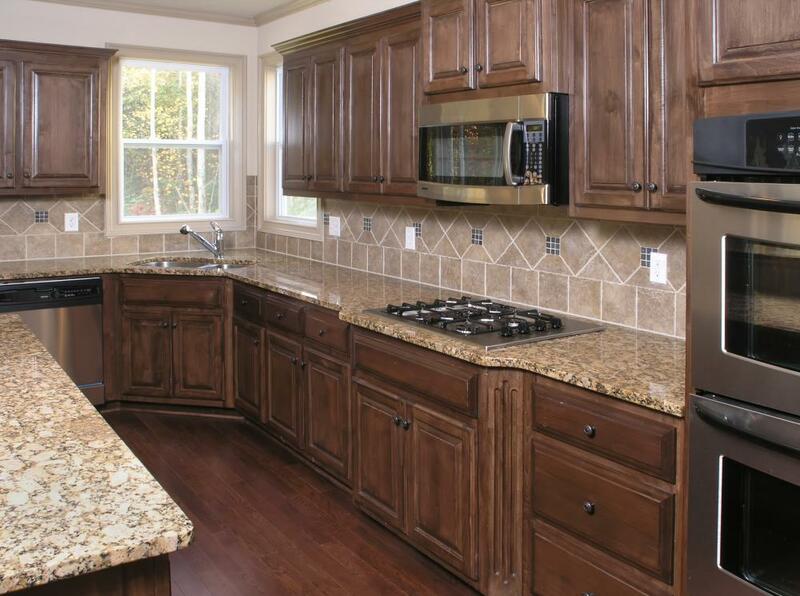 The best cabinet cleaner is Parker and Bailey Kitchen Cabinet Creme. If you can't find it at a local hardware store, it can be found at Solutions or Amazon. I first wash my cabinets with Murphy's Oil Soap according to the instructions on their bottle. Then I start in with the Parker and Bailey Kitchen Cabinet Creme using an old cut up bath towel. There's nothing like it! The second best is a product called Cabinet Magic that can be found at Lowe's or Home Depot. But, your cabinets won't shine as well or have your work last as long. Your wood cabinets will look like they were just installed. I did use the dawn dishwashing soap and a sponge with the green backing. Oh my gosh1 My 11 year old cabinets look like new! I wouldn't want to use the scrubby sponge very often but it sure worked to get the buildup off the little routed ledges! I finished up with some lemon oil that I wiped off lightly and I am so delighted! I'm so happy! This is the worst advice I've ever heard. Don't try these suggestions on your cabinets. Why on earth would the author suggest using a green scrubbing pad on cabinets? That is much too harsh and will eventually ruin them! I used the natural citrus ant spray at base and under edges of oak cabinets and the directions say to leave it on. So I did, but after a few days the ants were gone and wanted to clean off the gunk. Surprise -- it became part of the finish and now I have sticky everything. What will remove the oily residue without stripping the finish -- or if it does, what can I use to keep the wood from moisture damage until I can afford to refinish the cabinets? I just heard that there is another product out there calling itself a rejuvenator. Make sure you only buy The Victorian House Products. They don't have the silicon and wax buildup because they were invented for Antiques and even are used in museums and castles in England. Where can i purchase The Victorian House Rejuvenator Finish. Help? It sounds like exactly what i need! OK..i just simply used some warm -almost hot water, and a little bit of mr clean..smells great and cleans everything great..after a bit of man power..and its all dry..i used old english...that stuff is a miracle. im not kidding..its messy on your hands/gloves but the end result made my cabinets look like brand new..a lot of people noticed!! I have new white cabinets and was wondering what cleaning product or products would be best to keep them from turning yellow? I had a tenant that smoked for 14 years. Her kitchen cabinets went from light to golden. Is there any way to get it back to it's almost natural color? Can someone help me please? My kitchen cabinets are only 4 years old and I just tried using the Rejuvenate Cabinet Restorer and my cabinets are terribly streaky. I have tried 4 applications and they only look worse. I am sick about this. Does anyone have any ideas on how to get the streaks out? They looked better before I even tried this. Thank you so much for your help on this. I have tried the fantastic, and citrus oil products and all I get is gum. Cabinets or furniture of any kind has a clear finish, varnish, lacquer, etc. That sticky stuff is buildup and to add to the build up with anything with water or soap is going to make gum (the professional term is *gunk*). The best cleaner and repair for the faded finish is one made of the same kind of oil as the finish--petroleum base oil penetrates into a petroleum base finish. Not lemons or oranges--oil. OK, did you make your one-year-old scrub the cabinet? 13 years later, she's requesting tips on this board. How do you repair water damage on oak kitchen cabinets? i will try these suggestions. i notice that if i use my regular cleaner, it makes the cabinets feel gummy, like the finish is being affected. unfortunately, the previous owners of my house must have used some very harsh cleaners because all my lower cabinets are nearly stripped of their finish. the house is only 13 years old, so it's not like they're very old.